Day four of our Utah/Colorado Escape Campervan road trip found us heading from Zion National Park to Bryce Canyon. The parks are only about an hour and a half apart, which makes for an easy drive. We left Zion after breakfast and got to Bryce with plenty of time for some hiking and exploring the famous spiky rock formations known as “hoodoos”. Bryce Canyon is otherworldly! I have NEVER seen anything like it. We camped in Sunset campground and walked across the street to the trailhead and viewpoint. Looking out over the hoodoos in the Canyon for the first time was one of the coolest experiences I have ever had. It was as if we had stumbled across another planet – crazy!! I just want to bottle up that feeling of awe when seeing something like this for the first time. After taking in the views at Sunset point we started our descent into the canyon. We chose to string together the Navajo, Peekaboo, and Queens Garden loops for a great ~7 mile “sampler” hike in and around the canyon that gives great views from above and an up close and personal experience within the hoodoos. I highly recommend this hike (or parts of it if you can’t do the full 7 miles) if your time in Bryce Canyon is limited. It is the perfect way to experience the highlights of the park. If we had another day, we would have done the fairyland loop as well. Important points – You will be hiking at 7,400-8,000 ft. elevation (2200-2400 meters). Wear layers, it will be much colder here than it was in Zion! If it is a sunny day, you will warm up as you hike. Wind will also make it feel much cooler (and there were parts that were very windy on our hike!). Bring plenty of water, there aren’t any water sources on this loop. Expect plenty of company – these trails are popular with visitors and for good reason! The Peekaboo loop shares the trails with guided horse tours, so expect to encounter some horseback riders on this portion. Terrain – DRY and DUSTY. Smooth, well worn easy to follow trails. Non technical, not a whole lot in the way as far as rocks, etc. Some parts descending into the canyon (or climbing back up, depending on which way you chose) are steep – be careful if you have balance issues, especially going down! Hiking Time: It took us around 3 hours (I think? ballpark estimate) – probably a bit more since we took our time to stop, look around, explore, and take pictures. The hike starts out with a steep switchbacking descent into the heart of the hoodoo-filled canyon. From there you will weave in/around the rock formations and pine trees scattered throughout, before eventually climbing back up to your start point. I’ll leave it to the pictures to describe the rest, because my descriptions will never do this park justice. 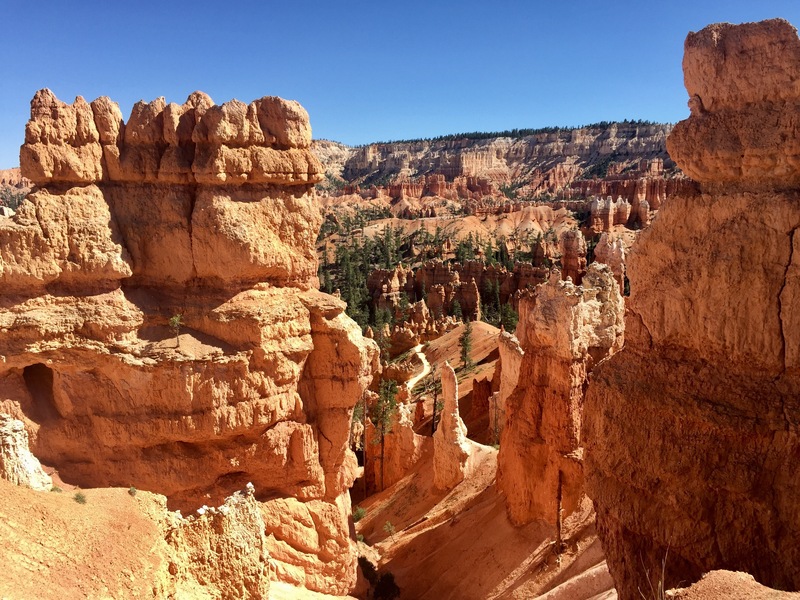 Bryce Canyon is a must see, in my expert opinion. What a unique, magical, mysterious place. Mother nature never ceases to amaze me. The colors, the shapes – WOW. The weather will be MUCH different. Prepare for this! We came from mid 90s and were in long pants and jackets at Bryce. The overnight temps were in the 30s. If you are camping/hiking be prepared for this, or you will be in for a very uncomfortable stay. You will feel the altitude change if you don’t live at elevation already. We are from Connecticut. Sea level. I was huffing and puffing. It is tolerable (if you are in reasonably good shape and don’t have any underlying lung or heart issues), but you will feel it. Pictures don’t do it justice. Just wait. You’ll see. I saw some photos of the formations, etc, but it is NOTHING like walking up to those viewpoints and looking down into that canyon. It took my breath away. (or maybe that was the altitude? see point #2). Either way, it’s stunning. Up next… We head up scenic route 12 to Moab – Camping in Dead Horse Point State Park and some hiking in Arches!